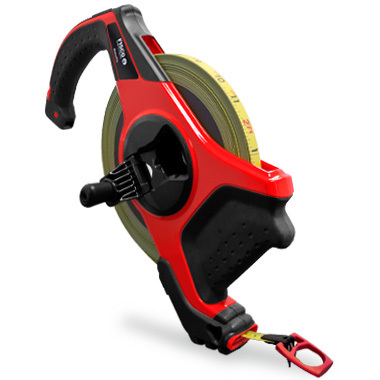 The outstanding result of five years of in-depth research and development, the Surveyor is a high performance surveying tape with a whole series of innovative design features. The impact resistant ABS frame houses a highly accurate ‘Tough Coat’ nylon coated steel blade which is accurate to EC Class I and is designed with a rubber grip top handle and a lower base grip, offering two comfortable methods to hold the tape. The unique right and left handed rewind handles make the Surveyor easy-to-use for both right or left handed users, plus the press button brake, locks the drum to allow the blade to be pulled taught, whilst maintaining firm and easy control of the hand grip. 13mm ‘Tough Coat’ nylon coated steel blade accurate to EC Class I. Impact resistant ABS frame with rubber overmould protection. Unique right and left hand flip-out ergonomic rewind handles. Press button blade lock with simple release. Integral ground spike for end-hook anchoring. Corrosion resistant triple action end-hook. Scaled diameter blade drum for balanced rewind speed. Easy clean blade feed with side flush apertures.